This close-up of the sun shows the source of a major X1.6 solar flare that erupted on Sept. 10, 2014 at 1:48 p.m. ET as seen by NASA's Solar Dynamics Observatory. A big storm erupted on the sun today (Sept. 10), and Earth was in the crosshairs. 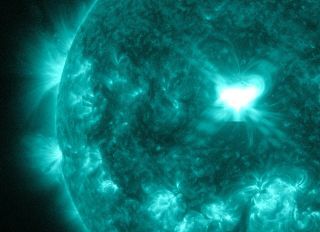 The sun unleashed an X-class solar flare — the most powerful type — at 1:45 p.m. EDT (1745 GMT) today from an Earth-facing sunspot known as Active Region 2158, which also fired off another intense solar flare yesterday. Both space weather events were captured on camera by NASA's sun-watching Solar Dynamics Observatory spacecraft. Today's solar flare qualifies as an X1.6 storm but poses no danger to anyone on Earth or the astronauts living aboard the International Space Station, NASA officials told Space.com. However, some people's lives could be affected by the solar tempest. "Impacts to HF [high-frequency] radio communications on the daylight side of Earth are expected to last for more than an hour," researchers with the National Weather Service's Space Weather Prediction Center (SWPC) wrote in an online update today. Further effects could be felt later in the week if the sunspot also fired off a cloud of superhot plasma known as a coronal mass ejection (CME). CMEs often accompany powerful flares and can trigger geomagnetic storms when they hit Earth, typically two to three days after erupting. Geomagnetic storms can temporarily disrupt GPS signals, radio communications and power grids, as well as intensify the beautiful auroral displays known as the northern and southern lights. It's probable that Wednesday's eruption did indeed produce a CME, SWPC researchers said. "Initial information suggests that a CME is likely associated with this event, but further analysis is underway at this time," they wrote in today's update. Scientists classify strong solar flares according to a three-tiered system, with C flares being the weakest, M flares medium-strength and X flares the most powerful. The sun is currently at or near the peak phase of its 11-year activity cycle, which is known as Solar Cycle 24. But our star has been relatively quiescent during Solar Cycle 24, whose max phase is the weakest in about 100 years, scientists say. NASA's Solar Dynamics Observatory is one of several spacecraft regularly monitoring the sun to track space weather events and their potential risks to astronauts and satellites.